With Alberto Contador still climbing behind them, none of those ahead could know what their final position would be on the podium. Without knowing, there were no fist pumps, no hands in the air, just men driving themselves as hard as they possibly could to get across the finishing line as quickly as they could. It wasn't until just over a minute later that Andrew Talansky (Garmin Sharp) knew that his efforts on the day had secured him the over all victory in the 66th Criterium du Dauphine, his first major stage race win at the tender young age of 25. Jurgen Van Den Broeck's (Lotto-Belisol) efforts were enough to move him onto the final podium with only Contador between these two. I must say that at the start of the day I never expected the ending to turn out as it did. I was surprised yesterday when Contador took the Jersey off of Froome's back, but I was sure the only possible change would be that Froome would take it back. In the end it was the dark horse of the young American that surprised most of us to claim the Malliot Jeune. Chapeau! This is an original watercolor and ink small (4"x6") painting that could be yours through a visit to my artist website at www.greigleach.com. To purchase this particular painting, just follow the direct link at the end of this post, and yes, I do ship internationally. 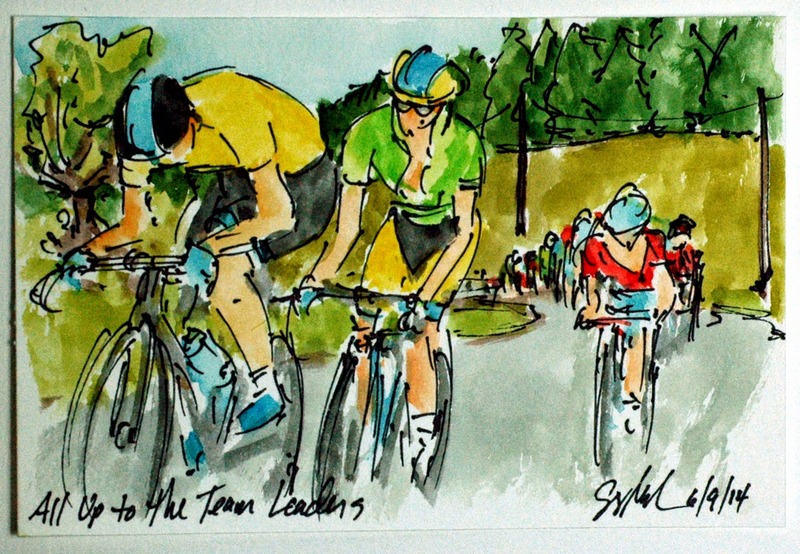 This is the last race I plan to paint ahead of the 101st Tour de France, so thanks for reading, (and a big thank you to those of you who have bought one of these little cycling treasures) and I will see you again in three weeks. Why the early break was allowed to get away from the peloton that contained the Yellow and Green Jerseys will long be debated, but Alberto Contador (Tinkoff Saxo) set about doing what had to be done. 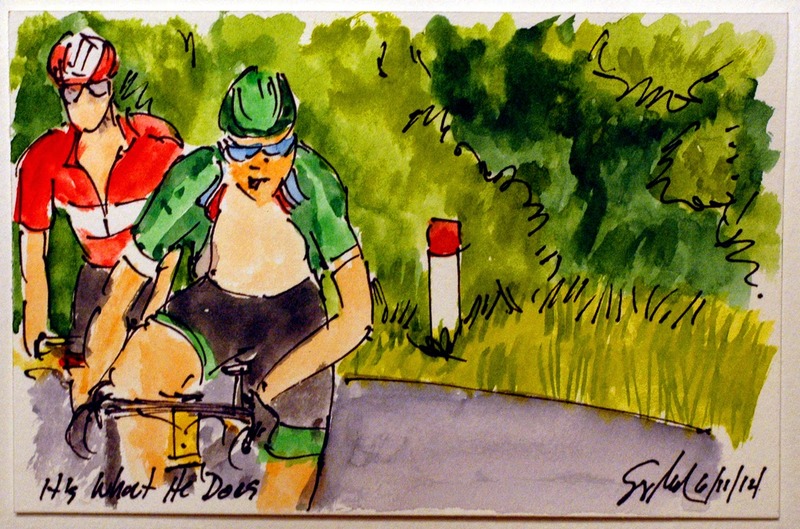 He had started the day with 8 seconds on Chris Froome (Team Sky) who he left struggling at the base of the previous climb and with 39 seconds on Andrew Talansky (Garmin Sharp) who was up the road about to summit the final climb of the 66th Criterium du Dauphine. 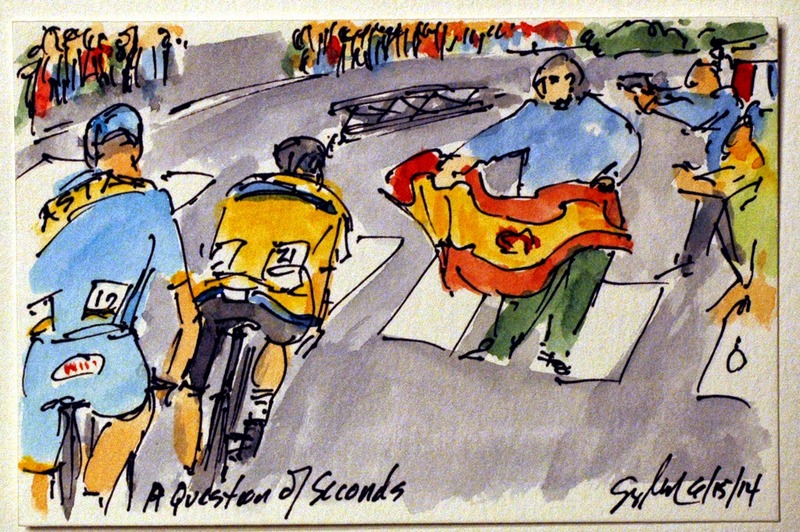 Contador knew that he had to ride as hard as only he can to catch the American and keep his coveted fleece of yellow. Jakob Fuglsang (Astana) knew he had a good wheel to follow that would carry him up the mountain and up the GC. Ultimately, Contador couldn't close the gap quick enough to hold the lead ceding a minute a six seconds on the stage, thus allowing Talansky to claim the Malliot Jeune by a mere 27 seconds. Fuglsang managed to move himself into the final slot of the top ten. This is an original watercolor and ink small painting (4"x6") that is available to own through my artist website at www.greigleach.com. To buy this particular painting, just follow the direct link at the end of this post, and yes, I do ship anywhere in the world. On the final climb of the Dauphine, Andrew Talansky (Garmin Sharp) had reason to hope that he could climb up in the GC as he climbed the Courchevel Le Prez. At this point he should have been told that Chris Froome (Team Sky) was losing ground to most everyone, and he was currently in the Virtual Yellow Jersey. However, he and everyone else, knows just how fast Alberto Contador (Tinkoff Saxo) can climb. Team Sky had already sent Mikel Nieve up the road in hopes of salvaging a stage win out of a rather dismal and disappointing day, but Talansky was only interested in gaining time on the Malliot Jeune and the stage victory wasn't on his radar. He had the help of his countryman, TeJay Van Garderen (BMC) who was trying to save face, and Jurgen Van Den Broeck (Lotto-Belisol) who was looking to gain time (and in a longer shot take the Yellow Jersey for himself). This is an original watercolor and ink small painting that is available to own through my artist website at www.greigleach.com. To purchase this particular painting just follow the direct link at the end of this post. But while you are there, why not take the time to browse through all of the artwork on offer? Romain Bardet (AG2R) kept flicking his elbow (the sign for the rider behind to pull through) and neither Jurgen Van Den Broeck (Lotto-Belisol) or Andrew Talansky (Garmin Sharp) weren't having anything to do with putting their noses in the wind. 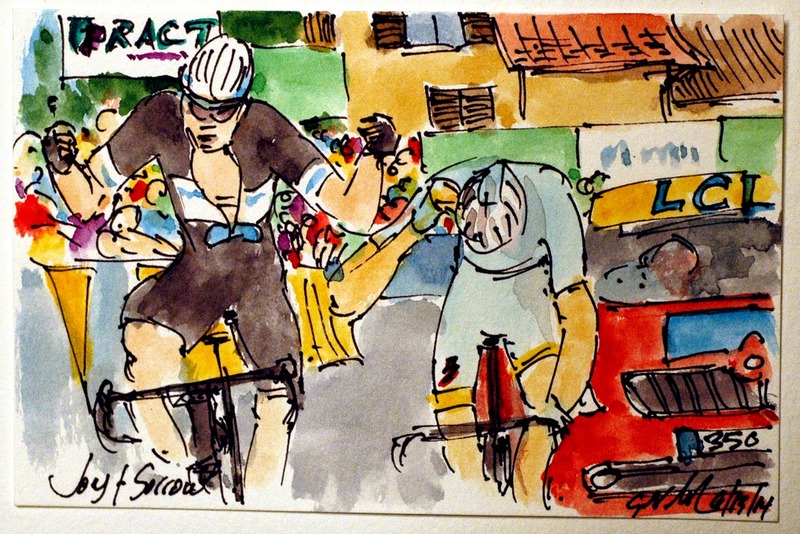 Bardet looked over his shoulder in disbelief, begging the others to do some work. The two behind him at as much if not more to gain than he did so he had every right to expect them to do some of the effort. Bardet had Wilco Kelderman (Belkin Pro Cycling) behind him, so was in search of the White Jersey, but then Talansky and Broeck were ahead of those above them on GC, at this point the American riding for Garmin Sharp was in the virtual Yellow Jersey. This is an original watercolor and ink small painting that is available to own through my artist website at www.greigleach.com. To purchase this particular painting, just follow the direct link at the end of this post. By the way, I do ship any where in the world, good luck. When Alberto Contador (Tinkoff Saxo) counter the Team Sky attack, the former holder of the Malliot Jeune, Chris Froome (Team Sky) wasn't able to answer the Spaniard's acceleration, even with the help of his faithful lieutenants, Richie Porte and David Lopez. Today was the first and only day of rain that fell on the peloton it somehow seem apropos to what was being played out on the roads up to Courchevel. By this point, Contador had already gained a minute on Froome, but an even bigger story was playing out further up the road. This is an original watercolor and ink small painting that is available for purchase through my artist website at www.greigleach.com. To buy this particular painting just follow the direct link at the end of this post. Shortly after the broadcast came on air, Team Sky played their second card, the first being putting two guys into the early break, more about that break shortly. The second was to attack the peloton and more importantly Alberto Contador (Tinkoff Saxo) just at the start of the penultimate climb of the day and the race. For a couple of minutes it looked like Sky had the measure of Contador who had been left isolated without any teammates. Simon Geraints and Richie Porte were their to try and pull there man back into the Malliot Jeune. As to the break away, it is beyond me why Team Sky and Tinkoff Saxo let a break form that contained most of the other GC riders. They let 3rd through 7th places amongst others get a 2 minute head start up the Cote de Montagny. Was it over confidence or was it exhaustion? I image the post race interviews will provide the answer. This is an original watercolor and ink painting measuring 4"x6" and is available to purchase through my artist website at www.greigleach.com. To buy this particular painting, just follow the direct link at the end of this post. Shipping is available internationally. Each multi stage race lines up the holders of the leader's jerseys at the start line of each stage. 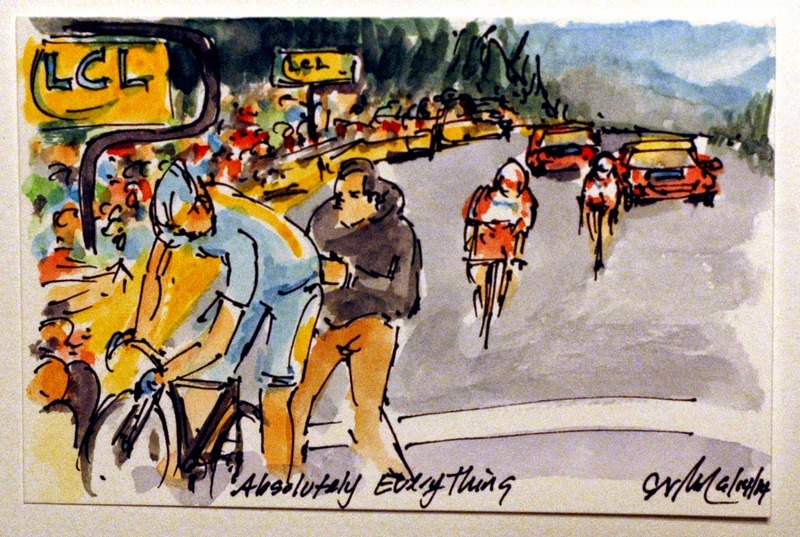 The Criterium du Dauphine is no different. There was an excellent moment before the roll out when Chris Froome (Team Sky) leaned over and shook the hand of Alberto Contador (Tinkoff Saxo). Contador had successfully taken the Maillot Jeune off of the back of Froome on the penultimate stage after the Brit had worn it from day one of the race. With the hand shake it appeared that it would be a race for hopeful stage winners with the GC to be left alone. I couldn't have been more wrong about how the coming stage to Courchevel was going to play out. Wow, is all I can say about the racing that was about to unfold. 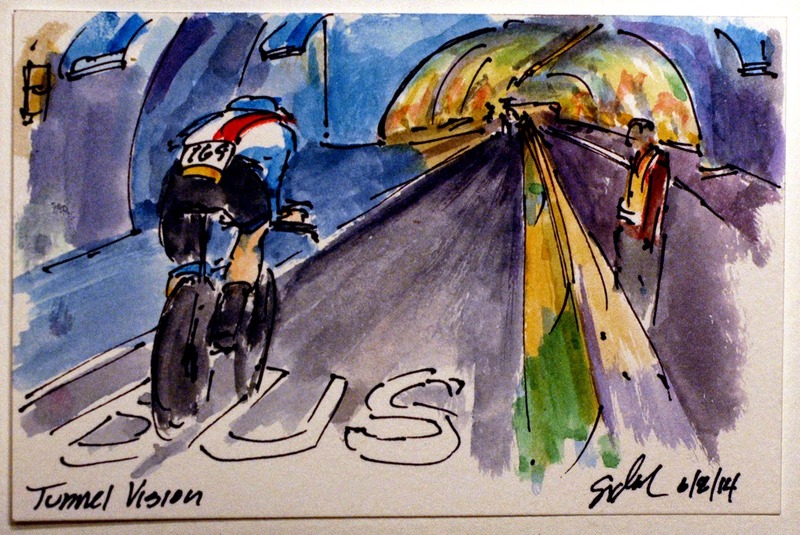 This is an original small watercolor and ink painting (4"x6" or 10cm x 15cm) that was created using Yarka St. Petersburg watercolors and Steve Quiller brushes from Jack Richeson and Company, www.richesonart.com. In addition, this painting could be yours through a visit to my artist website at www.greigleach.com . 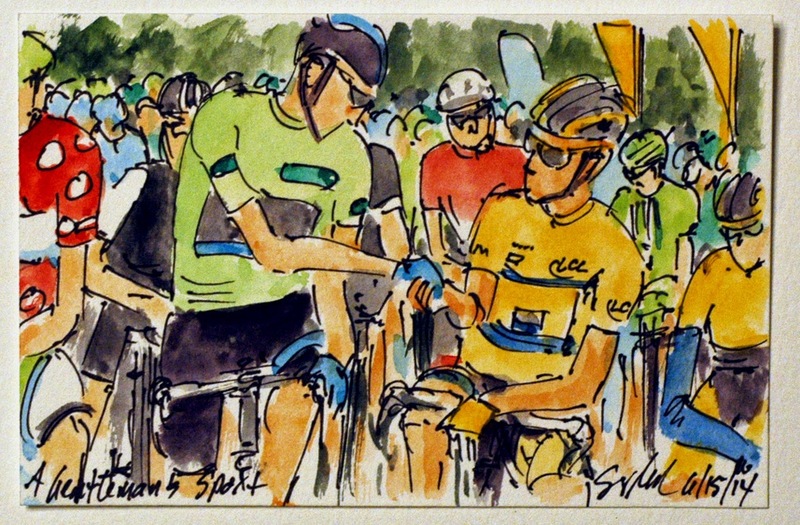 To purchase this particular painting, just follow the direct link at the end of this post to get your piece of the 66th Criterium du Dauphine. I do ship anywhere in the world. 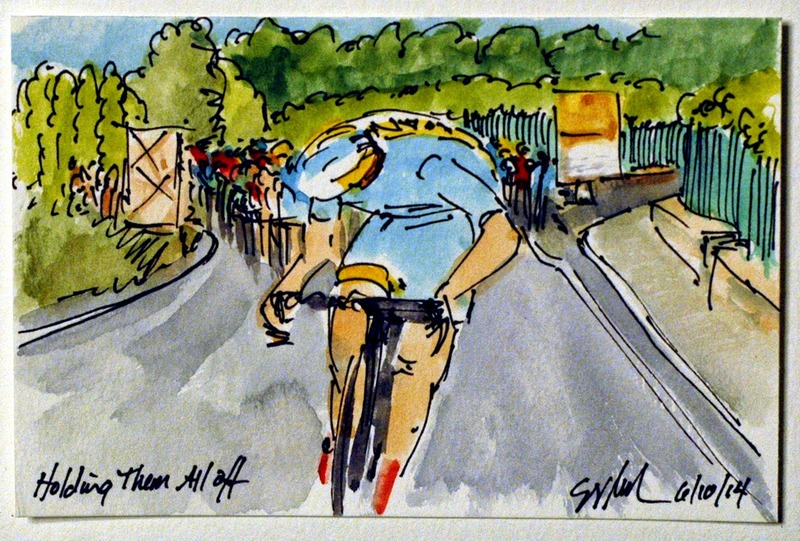 Lieuwe Westra (Astana) has been in search of a stage win almost every day of the Dauphine. Yesterday he was just nipped at the line by the superior sprint of Jan Bakelants (OPQS) much to the Dutchman's frustration. He must have decided that he wasn't going to make the same mistake today. He was distanced by the attacks of both Yury Trofimov (Katusha) and later Egor Silin (Katusha), but he didn't give up. He kept riding as hard as he could, eventually catching the two Russians inside of the final kilometer. It was obvious by the way that he just stopped, almost hitting the wall as he crossed the line, I am sure if there had not been a helper to grab him he would have fallen to the ground right there. He had nothing left to even wave a victorious salute. The race organizers were prepare for how exhausted the riders would be, they had arranged helpers to catch the riders as they crossed the line and to push them over the crest of the mountain. 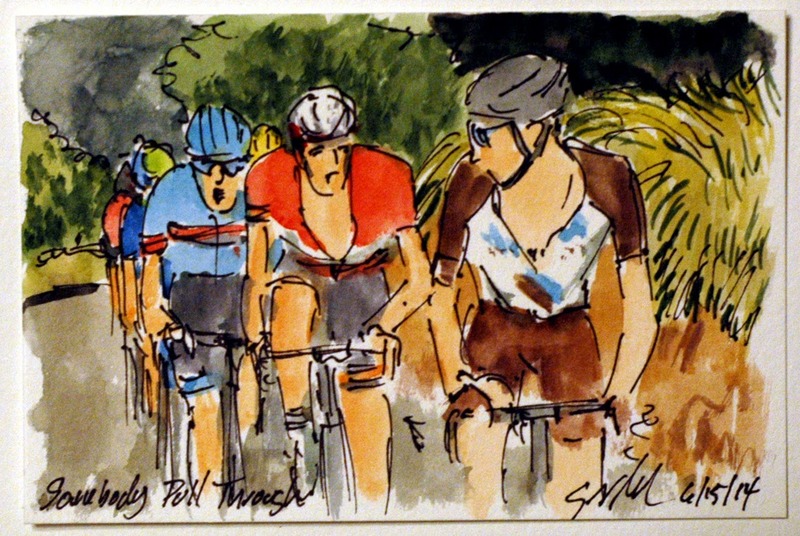 This is an original small watercolor and ink painting, 4 inches by 6 inches, that is available through my artist website at www.greigleach.com . To purchase this particular painting just follow the direct link at the end of this post. Alberto Contador (Tinkoff Saxo) now out of the Green Points Jersey, came to the Dauphine to win. 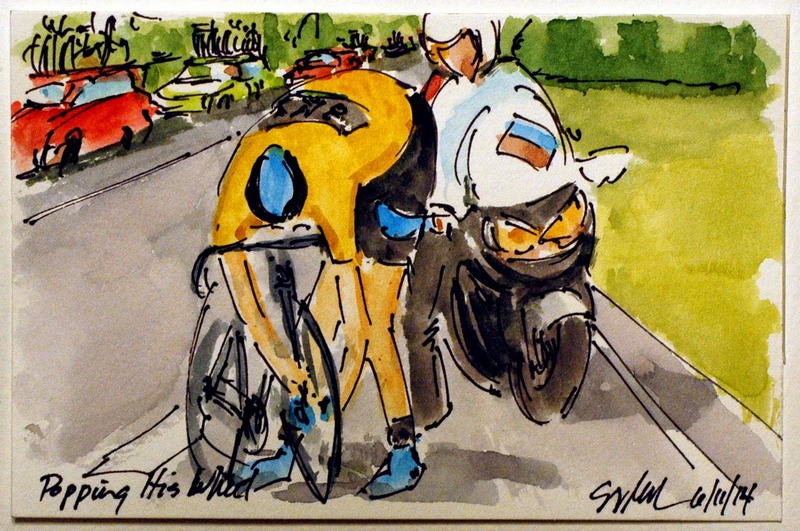 He went on the attack on the final descent of Stage 5 but was pulled back by the power meter boys of Team Sky. Since that method didn't work, he waited to Froome was left without any of his teammates and then laid down a vicious burst of speed with less than two kilometers to the line. I am figuring he didn't want to leave any room for the train to chase him back down. Today, his planned worked, while he didn't get the stage win, taking fourth on the day, he did cross the line 20 seconds ahead of Chris Froome (Team Sky) and that was eight seconds more than he needed to become the second man to wear the Malliot Jeune with only one more stage to race. I wonder if the crash from yesterday effect Froome's ability to climb. Although it certainly didn't effect the condition of the rest of the Sky team. This is an original small watercolor and ink painting (4"x6") that is available through my artist website at www.greigleach.com. To buy this particular painting just follow the direct link at the end of this post. After Yury Trofimov (Katusha) rode away from the break away, the first to come up to him was his teammate, Egor Silin (Katusha). The team obviously had a plan and a very strong desire to take a third stage in this Criterium du Dauphine. I wonder if the plan was to let Silin take the stage so the team could have three different riders take a stage. I was very impressed to see the wheel chair riding fan so high up the mountain. They are currently over a kilometer from the summit so it was either a scary ride down the mountain or a very, very long trip up. This is an original small watercolor and ink painting (4"x6") that could be yours by visiting my artist website at www.greigleach.com. 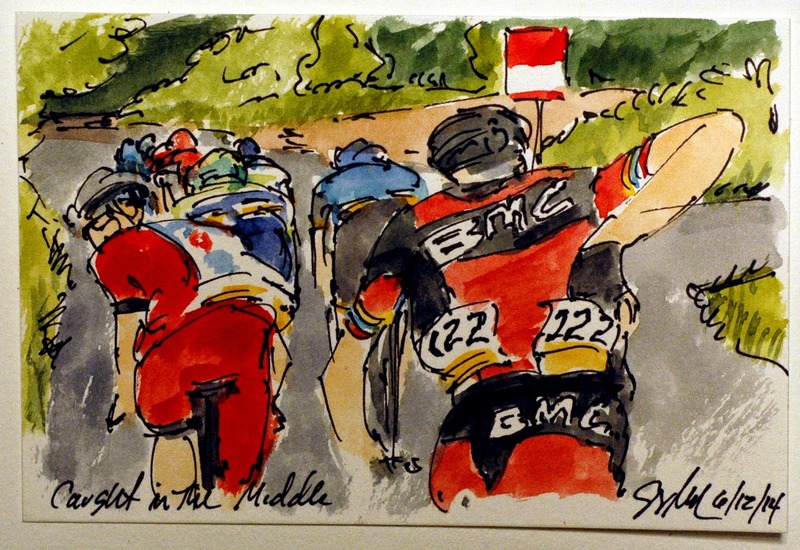 To purchase this particular painting, just follow the direct link at the end of this post to bet your piece of the 66th Criterium du Dauphine. 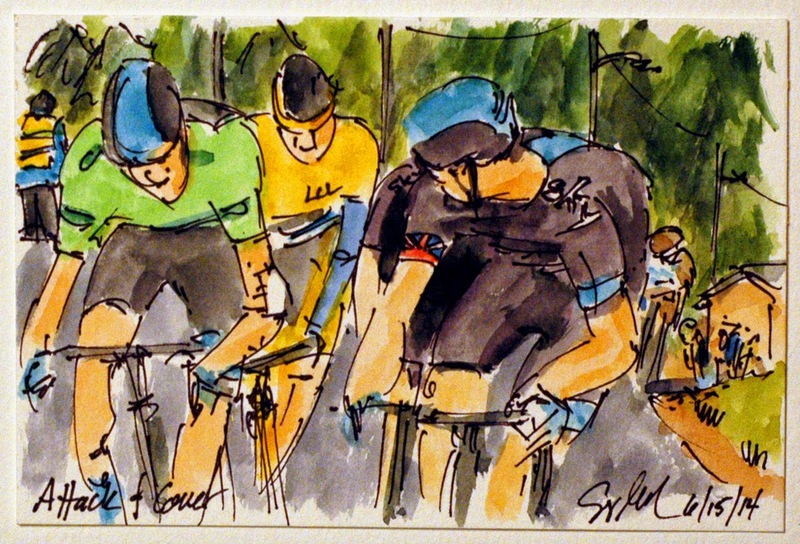 Team Sky has been so powerful on each and every climb of the Dauphine. They have hit the bottom of every climb with 4 or 5 guys in front of Chris Froome's (Team Sky) Malliot Jeune. They set a relentless pace thinning out the peloton to as few riders as possible. 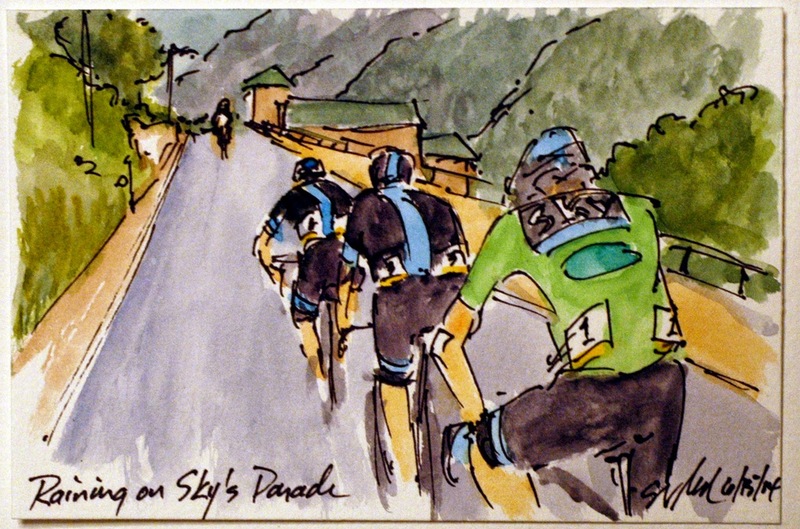 Then as each Sky teammate pops, he will swing off and try to finish the climb as best they can. That is exactly what David Lopez (Team Sky) has just done, he is radioing the team car to let them know he has done his job and can't do anymore. 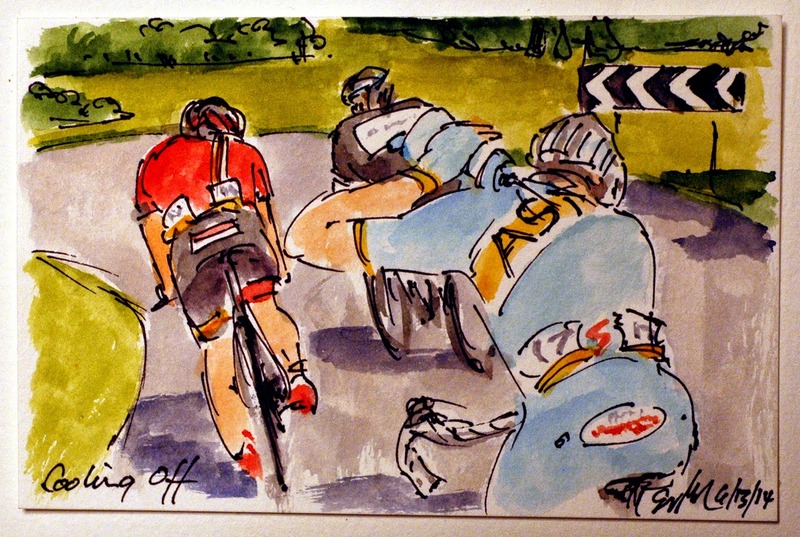 So he slides away as the rear of the peloton tries to hang onto the continued pace of his teammates. This is an original small watercolor and ink painting (4"x6") that could be yours through a visit to my artist website at www.greigleach.com. 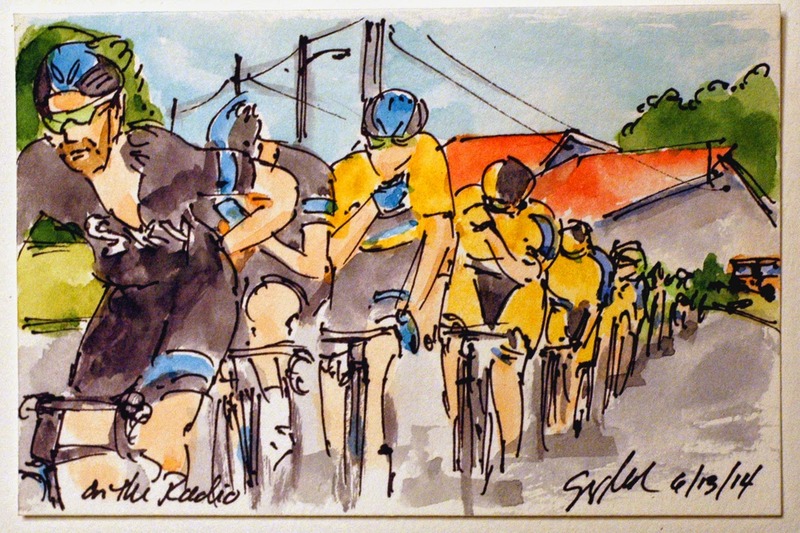 To purchase this particular painting just follow the direct link at the end of this post to get your piece of the 66th Criterium du Dauphine. Vincenzo Nibali (Astana) has a reputation of being a gifted descender, a gift he decide to use on the final big downhill of the stage. He must have figured that Chris Froome (Team Sky) would be nervous after his crash in Stage 6, a crash that left him bloodied and in need of stitches (and not because he was laughing). Nabali started the day in 6th place around a minute down on Froome's Malliot Jeune and a good head start up the final climb might be just the trick to take over the overall lead. This is an original small watercolor and ink painting that is available through my artist website at www.greigleach.com. To purchase this particular painting just follow the direct link at the end of this post. Yury Trofimov (Katusha) went on the offensive on the Col de la Forclez, he was the first over the top of the climb and the first to ride out of France into Switzerland. Katusha has been wrapping up their trip to the Dauphine very nicely having grapped two stage wins, one going to Trofimov just three days ago. It looks like the plan was to make it three wins at the end of the day. While he picked up maximum points in the King of the Mountains competition, Alessandro De Marchi padded his lead on the earlier climbs of the stage (prior to TV coverage) pretty much insuring his holding the Polka Dot jersey through the final day of racing. This is an original small watercolor and ink painting (4"x6") that could be yours by visiting my artist website at www.greigleach.com. 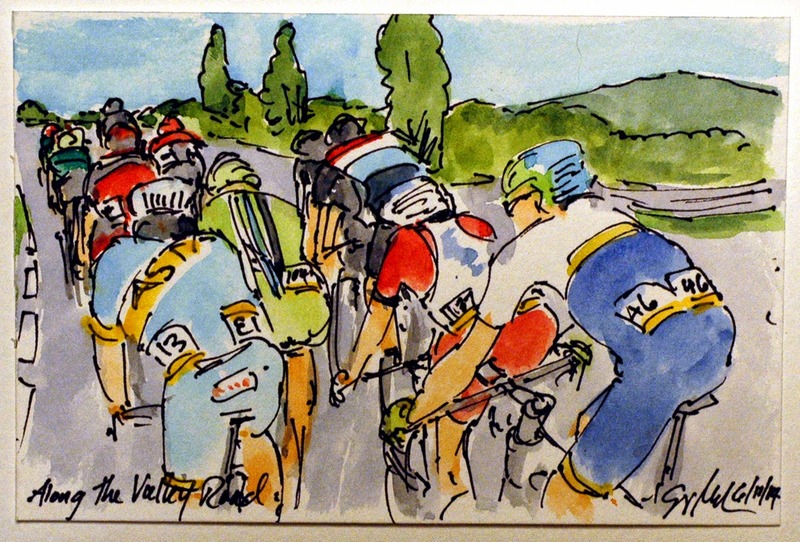 To purchase this particular painting, just follow the direct link at the end of this post to get your piece of the 66th Criterium du Dauphine. And yes, I do ship anywhere in the world. The penultimate or Queen Stage of the Criterium du Dauphine feature way to many climbs with two Haute Catagorie climbs inside of the last 18 kilometers of the 160 kilometer day. Once they break away hit the penultimate climb up the Col de la Forclez, the cohesion broke up and the strong men went on the attack. Cyril Gautier (Europcar) had an ill timed mechanical throwing his arm up for help as Greg Van Avermaet (BMC) went over the top of the Frenchman to catch the wheel of Johan Alaphilippe (OPQS) trying to follow the attacking front of the break away. This is an original small watercolor and ink painting that measures 4 inches by 6 inches and was created using Yarka St. Petersburg watercolors and Steve Quiller brushes from Jack Richeson Company, www.richesonart.com. This painting is available for purchase through my artist website at www.greigleach.com. 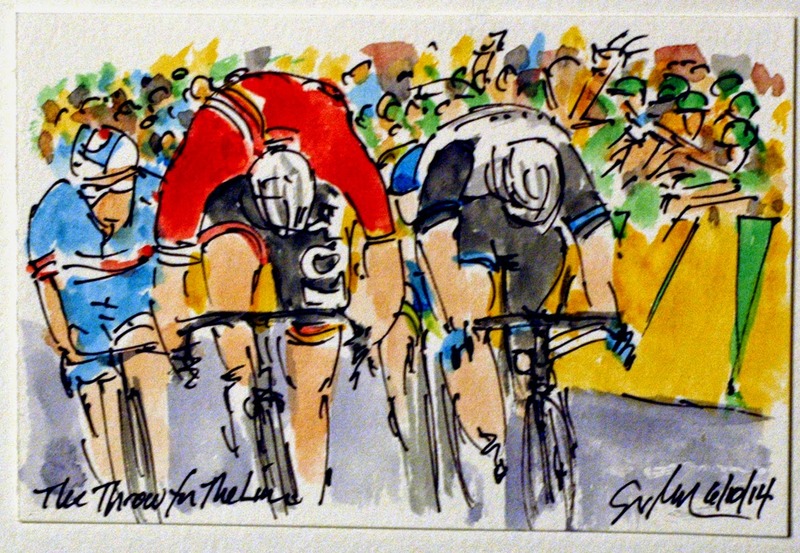 To buy on this particular painting just follow the direct link at the end of this post to get your piece of the 66th Criterium du Dauphine. To say that Chris Froome (Team Sky) had a rough day would be an understatement. As of this writing, I don't know what happen to have the TV cameras find him trying to get his chain back on and Alessandro Vinotti (Astana) sitting out in the weeds at the side of the road. However, it is obvious that he went down hard on his left side and then on into the dirt along the side of the road. It was a similar wreck that convinced me that I was done racing, but Froome went on to finish the stage. 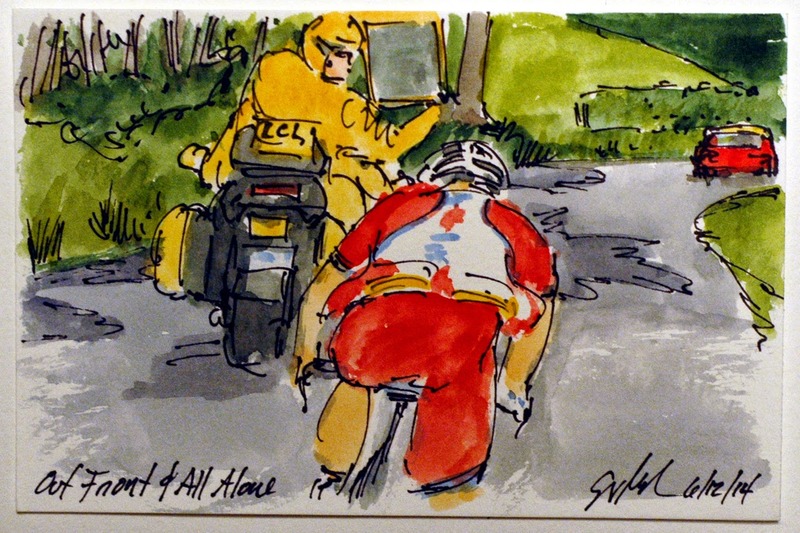 Unless his wounds are worst than the road rash and ripped kit, he will be signing in for the next two hard mountain stages that bring the Dauphine to a close. As soon as he crossed the line, the Sky soigneurs began tending to him, but I am sure he is having a rough night sleep tonight. This is an original small watercolor and ink painting (4"x6") that could be yours through visiting my artist website at www.greigleach.com. To buy this particular bloody painting, just follow the direct link at the end of this post. Lieuwe Westra (Astana) and Jan Bakelants (OPQS) got rid of their third fellow attacker, Pim Ligthart (Lotto-Belisol) so that they could get the stage win they were both so desperately seeking. At about 1.2 K left to go the pair came to a virtual stand still, a track stand, each trying to get the other to make the first move. It is much easier to win from the pack of the group than from the front. From the back you have the element of surprise. As to prove the point, Westra went first after the track stand, and Bakelants was able to get around him in the end to claim victory in Poisy, leaving Westra to clinch his fist in frustration. This is an original small watercolor and ink painting (4"x6') that could be yours through my artist website at www.greigleach.com. To purchase this particular painting, just follow the direct link at the end of this post. This is the second time I have seen the Malliot Jeune of Chris Froome (Team Sky) standing on the side of the road fiddling with his bike while he waits for the mechanic. This, however, was a little more serious than the puncture of Stage 4. Both Froome and Alessandro Vinotti (Astana) took a tumble into the high weeds at the side of the road, fortunately both were able to get back on a bike and continue racing. Another tradition of the pro peloton, is that the GC men and their teams will sit up (cut back the pace) and wait for the Malliot Jeune to rejoin the peloton. If their is a break up the road they are not expected to wait, so it played to their advantage that the peloton waited for Froome, it insured that one of their number would take the honors at the finishing line in Poisy. This is an original small watercolor and ink painting (4"x6") that is available through my artist website at www.greigleach.com. To purchase this particular painting, just follow the direct link at the end of this post. Today's 178.5 kilometer stage from Grenoble to Poisy had its regular break away that include a total of 15 riders from 14 teams, with roughly 20 K to go these three, Lieuwe Westra (Astana), Pim Ligthart (Lotto-Belisol) and Jan Bakelants (OPQS), got away from the rest through the attack of Westra. All three of these guys have been in a number of breaks thus far in the Dauphine, each hoping to bring glory to their teams and themselves. Today was another rather warm day in eastern France, so after Westra had a drink from his bidon, he squirted water across his chest, on his head and onto the back of his next, all in an effort to beat the heat. This is an original small watercolor and ink painting (4"x6") that could be yours through visiting my artist website at www.greigleach.com. To buy this particular painting, just follow the direct link at the end of this post. As in any team, each member has a job (or various jobs to do) in the pro peloton the job of going back to the team car, retrieving as many bottles as one can carry and then riding back up through the peloton passing out the bottles to the team goes to a Domestique. He is usually a younger rider, or a strong rider that doesn't have a hope for the GC and hasn't been assigned to looking after the team leader. You will see these hard working guys doing this task on the steepest of climbs, carry 20 extra pounds of weight by virtue of the extra bottles, then riding pass many members of the peloton handing out refreshments like a beer man at the stadium. This is FDJ who have come to the front of the peloton in hopes of catching the break away so that their sprinter has a chance for the stage win. This is an original small watercolor and ink painting (4"x6") that is available through my artist website at www.greigleach.com. 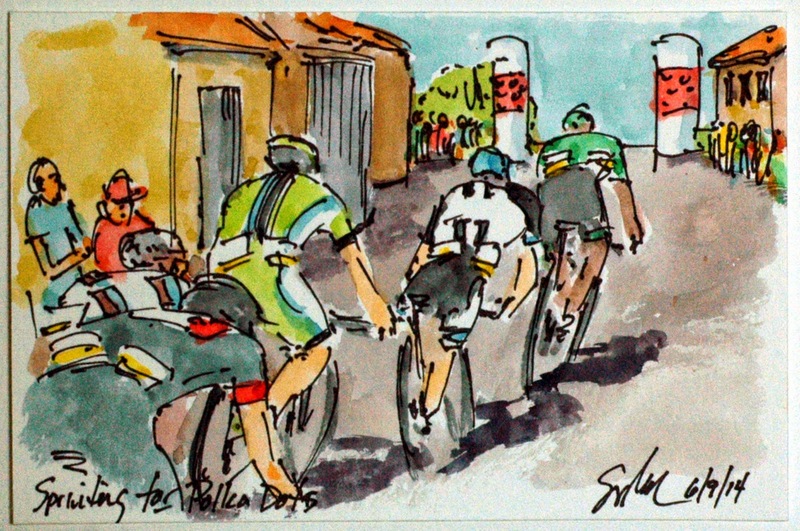 To purchase this particular painting, just follow the direct link at the end of this post to get your piece of the 66th Criterium du Dauphine. Modern technology being what it is all of the riders now have two way radios that allow them to talk with the team car and with each other for that matter. Chris Froome (Team Sky) is checking in with the team car to see what they should do about the 15 man break away up the road. The teammate right in front of him seems to be radioing his opinion on the matter. Right behind the team of Alberto Contador, Tinkoff Saxo is on the radio as well, perhaps checking to see if there is another good spot for Contador to attack Froome as he did in Stage 5. The other pass time in the peloton, eating to keep up one's energy, a hard task considering the 6,000 calories these guys well burn in a single typical stage of racing. This is an original small watercolor and ink painting (4"x6") that was created using Yarka St. Petersburg watercolors and Steve Quiller brushes from www.richesonart.com. In addition, this painting could be yours through visiting my artist website at www.greigleach.com. Just follow the direct link at the end of this post to purchase this particular painting. Certainly Simon Spilak's (Katusha) victory was a solo win, having gotten away on the final climb of the day, but he hardly crossed the line alone. The Slovenia was accompanied to the line in La Mure by the race referee's red car, the yellow motorcycle of the time keeper, the race communication moto and one of the TV motos as he raised his arms in a jubilant victory celebration. This is the second victory in a row for Katusha and this time the Director Sportif made sure his man zipped up his jersey before claiming the stage for the team. This is an original small watercolor and ink painting (4"x6") that could be yours through my artist website at www.greigleach.com. 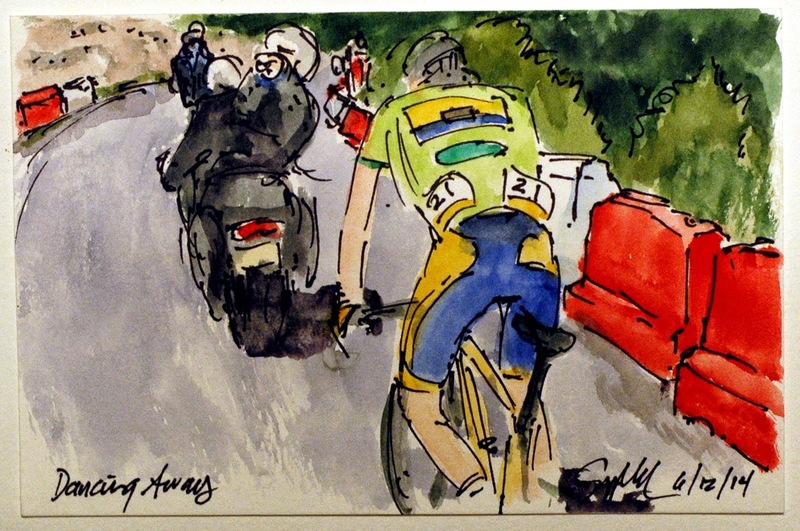 To purchase this particular painting just follow the direct link at the end of this post to get your piece of the 66th Criterium du Dauphine. With Simon Spilak (Katusha) up the road and the Team Sky led peloton chasing hard behind, what was left of the break was caught in no man's land between the two. While John Darwin Atalpuma (BMC) rummaged in his pockets for an energy gel and Egor Silin (Katusha) look over his shoulder to see where Team Sky was at, Adam Yates (Orica GreenEdge), Bartosz Huzarski (Netapp-Endura) and the others just kept turning over their pedals. With only 15 kilometers left in the stage, they could at least be racing for second place and some time on the GC. This is an original small watercolor and ink painting (4"x6") that could be yours through my artist website at www.greigleach.com. 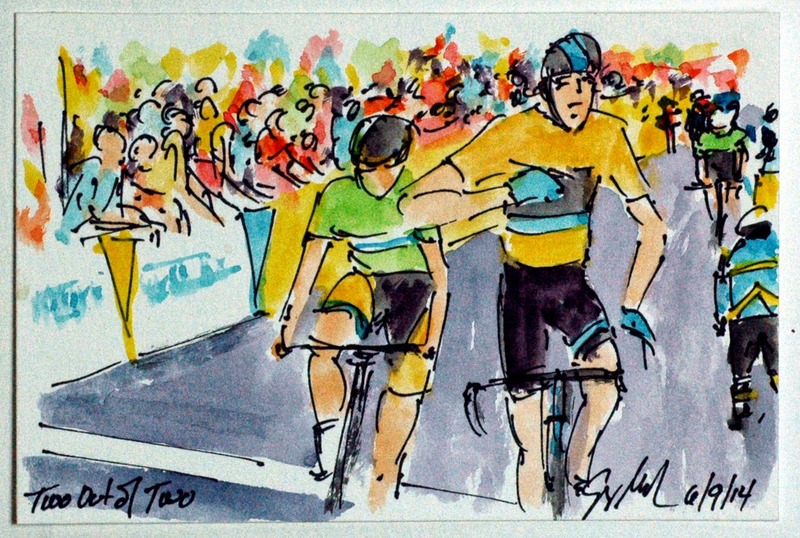 To purchase this particular painting, just follow the direct link at the end of this post to get your piece of the 66th Criterium du Dauphine. While Alberto Contador (Tinkoff Saxo) used the descent of the Col de la Morte to try and attack the peloton, Simon Spilak used the following climb to attack the remainder of the early break away. He and Christophe Le Mevel (AG2R) got away on the way up the Cote de Laffrey but the Frenchman couldn't hold the wheel of the motivated Slovenian. Spilak, a great time trialist, used his skill and power to push on from the top of the climb on the mostly flat road to La Mure and possible victory. This is an original small watercolor and ink painting (4"x6") that could be yours through my artist website at www.greigleach.com. To purchase this particular painting just follow the direct link at the end of this post. On the descent of the Col de la Morte, Alberto Contador (Tinkoff Saxo) sitting second on GC, surprised Team Sky, Chris Froome (Team Sky) and the whole of the peloton by attacking. Contador is not only an excellent climber, but he is equally skill going down the mountain as well. By the time he was well up the final climb on the Cote de Laffrey, he had put a minute into Froome's Malliot Jeune becoming the virtual leader on the road. Team Sky, much to the annoyance of their competitors, have the resolve to raise the pace and slowly ride back onto the wheels of most anyone who tries to get away. So while it look like a winning move, Contador was shortly back into the Sky led peloton and soon to have his position on GC threatened by Wilco Kelderman (Belkin Pro Cycling). This is an original small watercolor and ink painting, 4"x6", that could be yours through my artist website at www.greigleach.com. To purchase this particular painting, just follow the direct link at the end of this post. A little while ago there was a Mime circulating on twitter showing cyclist having crashed pretending they are fine, and footballers pretending they were hurt without any contact at all. Michael Valgren Anderson (Tinkoff Saxo) proved that today on the descent of the Col du la Morte (fortunately not aptly named). He missed judged a corner and hit the guard rail flipping wheels over helmet landing on the weeds on the other side. Unlike some athletes, he quickly jumped up, put his bike back over the rail, got on, and sped on down the hill to help his team leader. There are countless stories of these kind of feats of determination in the world of cycling and others that don't work out quite so well. This is an original small watercolor and ink painting that could be yours through my artist website at www.greigleach.com. 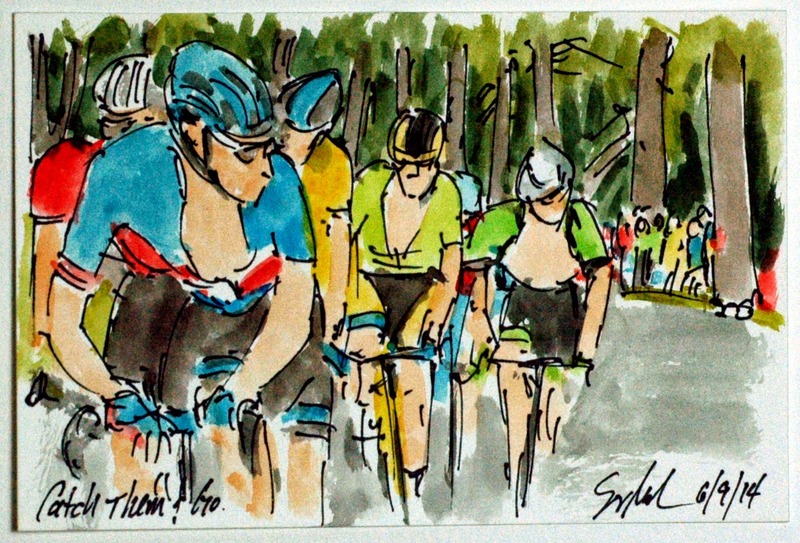 To purchase this particular painting, just follow the direct link at the end of this post to get your piece of the 66th Criterium du Dauphine. Stage 5 featured the required break away that went on the first climb of the day back up the Col du Manse yet again. The descent, which happened off camera, was the famed climb in the Tour du France where Beloki crashed smashing his hip and Lance Armstrong went across an open field, jumping back on to the road and rejoining the group he had been with. At this point Jan Bakelants (OPQS) was getting a little frustrated with his break away companions on the climb up the Col de la Morte, he was trying to get Alessandro De Marchi (Cannondale) Stafan Denifl (IAM Cycling) to come through and take a turn. To force them to come by he swerved to the other side of the road, they just followed him over there. Notice the TV cameraman standing on the rear of the motorcycle, this is how the wonderful film of the day after day of racing is captured. There are multiple motos following all of the action on the road augmented by two helicopters. This is an original small watercolor and ink painting (4"x6") that was created using Yarka St. Petersburg watercolors and Steve Quiller brushes from the American company, Jack Richeson & Co. at www.richesonart.com. This painting is available for purchase through my artist website at www.greigleach.com. To buy this particular painting just follow the direct link at the end of this post. Yury Trofimov (Katusha) managed to do what all riders in a break away hope for, he got the stage win! Trofimov got into the 13 man break, the one that finally stuck, and then launched an attack on the final climb of the day up the Col du Manse. He increased his lead over his erstwhile compatriots on the descend and managed to hold them all of across the flats into the City of Gap. I am not aware of the number of stages or races he has won, but he did break one of the cardinal rules of victory salutes. As he approached the line he check to make sure no one was coming, crossed himself and in his joy forgot to zip up his jersey. Team sponsors put their logos across the riders chests in hope of the victorious arm raised photograph that they can use for publicity. 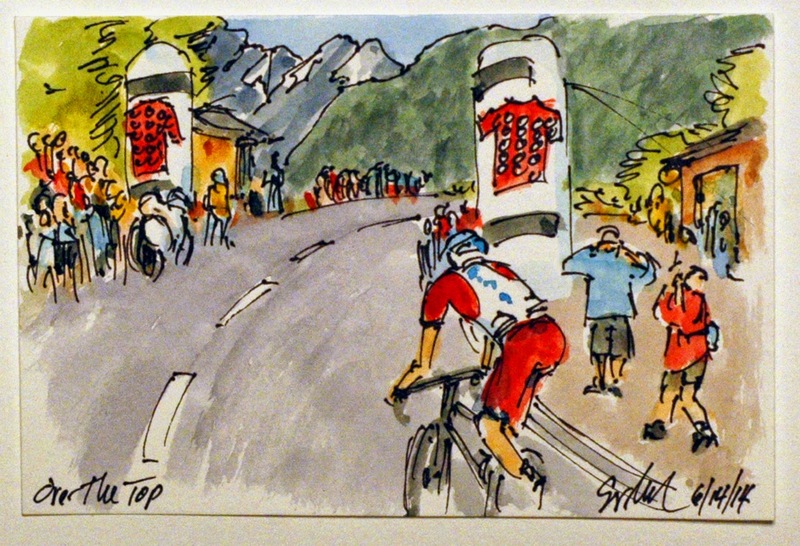 Unless a cameraman caught this view from behind, there won't be any Katusha posters of this stage win into Gap. This is an original small watercolor and ink painting that could be yours through my artist website at www.greigleach.com. To purchase this particular painting, just follow the direct link at the end of this post. The next to attack the Malliot Jeune and the rest of the peloton was Ryder Hesjedal (Garmin Sharp), perhaps hoping to atone for his miserable ascent of the Col du Beal the day before. He was quickly joined by two riders who saw a chance to take time out of Team Sky and Chris Froome. They were TeJay Van Garderen (BMC) and Maxime Bouet (AG2R), their efforts were not in vain, both gained 39 seconds on Froome and moved themselves into 19th and 7th respectively. It seems that Team Sky played the descent of the Col du Manse conservatively figuring that those ahead would not be able to gain too much time, and that the closest on the GC where still with him in the peloton. This is an original small 4"x6"watercolor and ink painting that could be yours through my artist website. 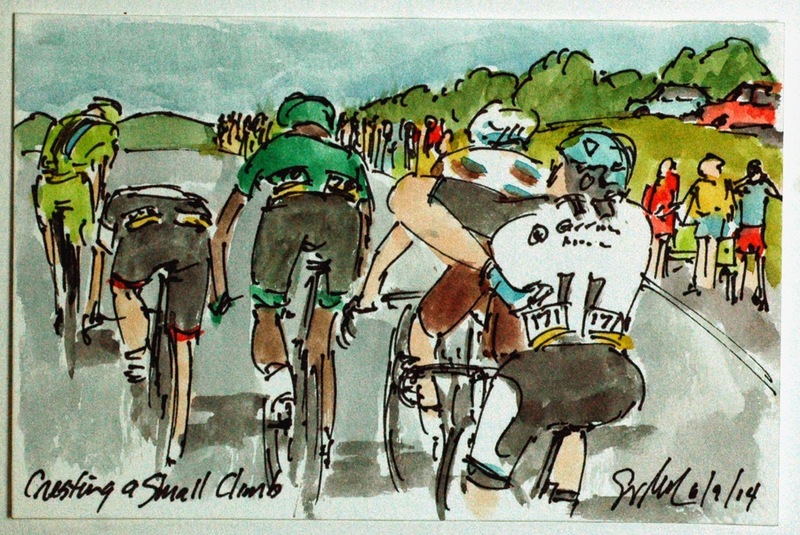 To purchase this particular painting, follow the direct link at the end of this post to get your original art from the 66th Criterium du Dauphine. Tommy Voeckler (Europcar) is the darling of the peloton. He spent most of the day hanging around the back of the peloton even drifting off the back just a few minutes before he launch this attack on the Col du Manse. So yes, he went from off the back to off the front in less than a kilometer. 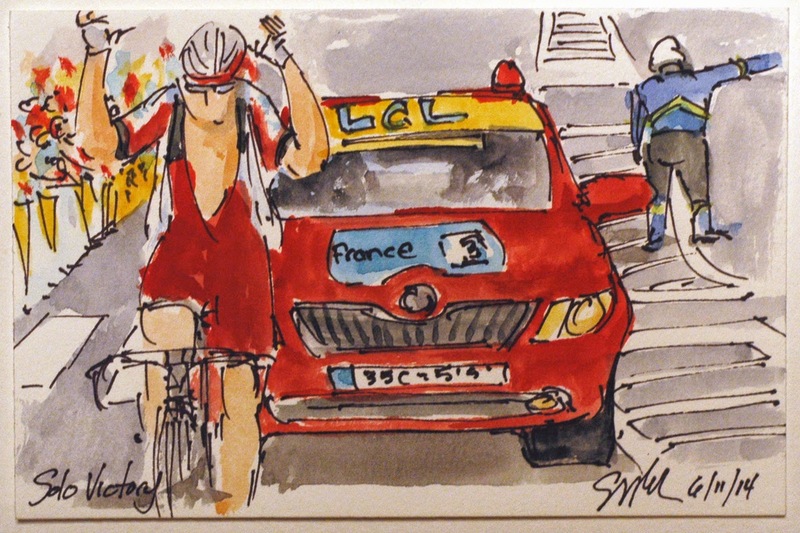 I am sorry to say I never caught the name of the Lotto-Belisol rider who tagged on to the little French man's wheel. Team Sky let them go, knowing that their tempo riding could be counted on to wheel the former French National Champion back into the fold. This is an original small 4"x6" watercolor and ink painting that could be yours through my artist website at www.greigleach.com. To purchase this particular painting, just follow the direct link at the end of this post. Not to be confused with 'Popping a Wheelie', something that Peter Sagan (Cannondale) is known to do when cresting the Alpine climbs of the Tour de France, Chris Froome (Team Sky) his popping his wheel off of his fork as he waits for his mechanic to show up with another wheel. The UCI has required that the forks have a recess to keep the wheel from falling out of the fork if the quick release is not properly tightened. While this is common in bikes for the general public it slows down the time it takes to change a wheel because it requires a further adjustment of the quick release skewer. 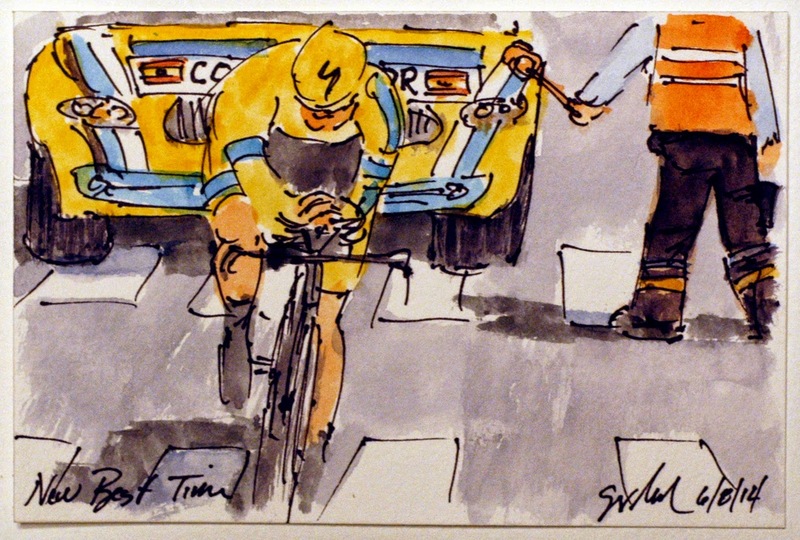 Froome is decreasing the time it will take to change his wheel by pulling the it out before the mechanic arrives. Ironically, the mechanic just brought a new bike (he may not have known what the problem was so he went for the solution that would solve any problem). This is an original small 4"x6" watercolor and ink painting that is available to own through my artist website at www.greigleach.com. To purchase this particular painting, follow the direct link at the end of this post. 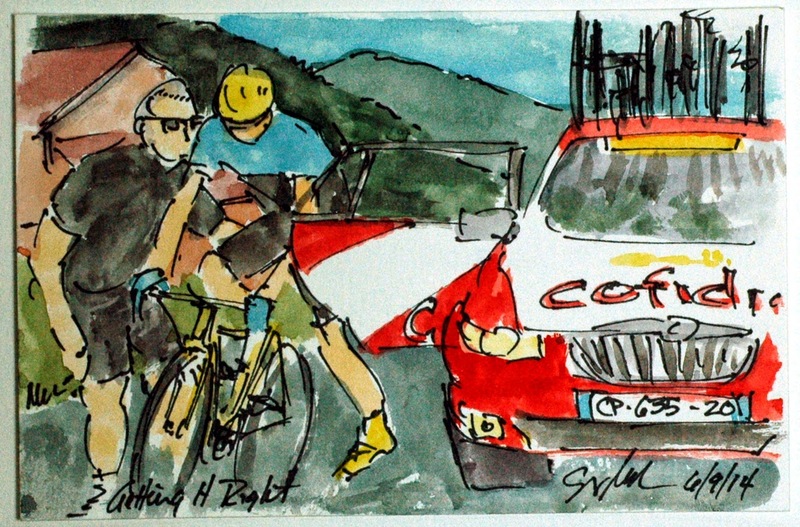 Only $50 USD for this original piece of art from the 66th Criterium du Dauphine. Stage four featured the largest break away group thus far in the Dauphine. After several different groups attempted to get away (all were pulled back because they were too high up on the GC) this group established itself with a maximum of almost four minutes on the peloton and the Yellow Jersey. Some of those represented included the best placed on GC, Yury Trofimov (Katusha) along with Christian Meier (Orica GreenEdge), Andriy Grivko (Astana), Damiano Caruso (Cannondale) and Jan Bakelants (OPQS). 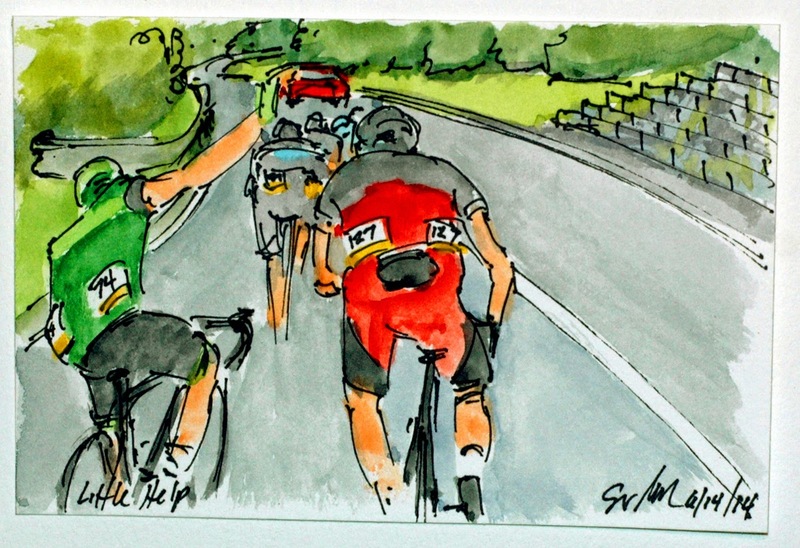 Once the group hit the road into Gap ahead of the final climb up the Col du Manse, the peloton ramped up its speed in order to position the favorites for the coming ascent. This is an original small watercolor and ink painting that was created using Yarka St. Petersburg watercolors and Steve Quiller brushes from the Jack Richeson Company, www.richesonart.com Also this work is available for purchase through my artist website at www.greigleach.com. To purchase this particular painting, just follow the direct link at the end of this post. The final sprint between Kris Boeckmans (Lotto-Belisol) and Nikias Arnot (Giant Shimano) was so close that I nor the commentators could figure out who had taken the stage. The only clue was Boeckmans pounding his handlebars after crossing the line. It wasn't until the photo finish was shown that it was apparent that Arnot had managed to just hold off the charging Belguim. I do mean just, the photo showed the margin of victory was the width (technically the height) of a racing tire. Giant Shimano also picked up third on the stage, and FDJ could only manage seventh for Arnaud Demare. Perhaps they had put too much energy into the chase to have the legs for the lead out at the end. This is an original small watercolor and ink painting that is available through my artist website at www.greigleach.com. To purchase this particular painting follow the direct link at the end of this post. Do hurry, the is only $50 USD and I ship anywhere in the world for roughly $2 USD. Good luck. After the second break was caught by the peloton, it was Liuewe Westra (Astana) turn to have a go at the stage win. Westra is a very formidable time trialist and he managed to hold off the angry peloton for roughly two kilometers, finally succumbing to their will just short of the flame rouge that marks the final kilometer of the stage. This is an original small 4"x6"watercolor and ink painting that is available for purchase through my artist website at www.greigleach.com. To purchase this particular painting, just follow the direct link at the end of this post. Jens Voigt (Trek Factory Racing) got a jump on the sprinters and their teams and got away with seven other compatriots, all in search of the surprise stage win. FDJ, OPQS, Giant Shimano and Katusha all missed putting a man in the break, so they all went off in pursuit. Even the French National Champion, Arther Vichot (FDJ) got into the act on the business end of the peloton. It wasn't until nearly the entire team of Katusha got on the front that the break was finally caught with less than seven kilometers left to race. This is an original small, 4"x6", watercolor and ink painting that is available for purchase through my website at www.greigleach.com. To purchase this particular painting, just follow the direct link at the end of this post. 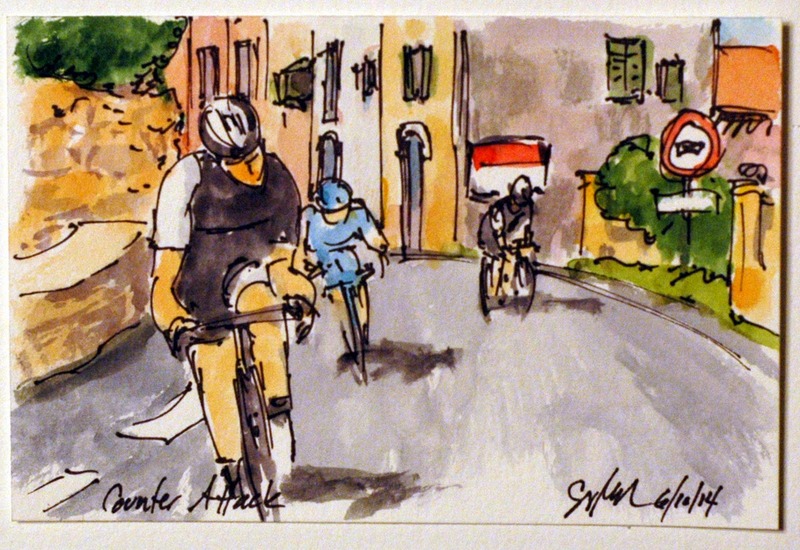 Once the peloton was all back together, Jens Voigt (Trek Factory Racing) - you know, the man of 'Shut Up Legs' fame - saw his chance to attack the peloton in the narrow twisting streets of this picturesque river town. Voigt's attack came with 20 kilometers to go and another seven riders eventually bridged across to the elder statesman of pro cycling. Trek Factory Racing was hoping to get a stage victory with Jensie having had their designated sprinter crash out of the race early in the stage. This is an original watercolor and ink postcard that is available through a quick three day auction on ebay. To bid on this particular painting, just follow the direct link at the end of this post. 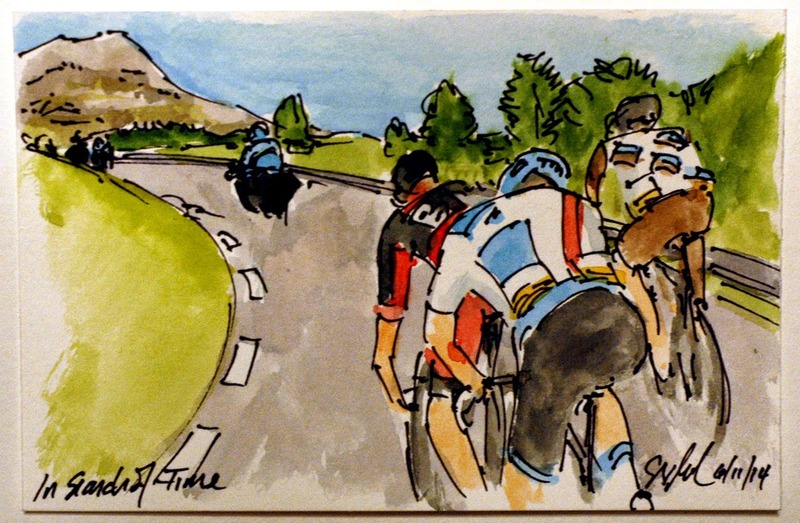 Dauphine Stage 3: Are They Here? After not seeing the peloton for nearly 120 kilometers, the three man break looked back over their shoulders to see the Team Sky and Tinkoff Saxo led pack coming up behind them. Cesare Benedetti (Netapp-Endura) considered giving it one more attack, but thought better of it, while Blel Kadri (AG2R) said his thank yous to Natnael Berhane (Europcar), The three had rode well together sharing the work load equally, but three are no match to the peloton when the sprinters want to have their day. This is an original small, 4 inch by 6 inch, watercolor and ink painting that is available through my artist website, www.greigleach.com. To buy this particular painting just follow the direct link at the end of this post. 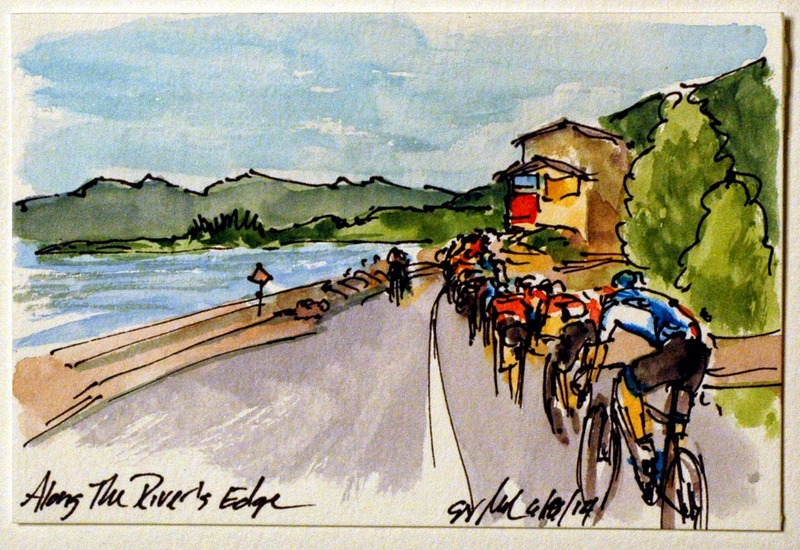 After climbing the Col de la Mure, the second of two Cat 2 climbs on today's stage, the peloton dropped down to speed along the edge of the Rhone River for a flat 39 kilometer all out run to Le Teil. With that much distance from the final climb to the finishing line, it was likely to be a day for the sprinters. Sadly for Trek Factory Racing, their sprinter, Giacomo Nizzoli, crashed out of the race before getting to contest a single sprint in the Dauphine. He had the frustration earlier in the Giro d'Italia of always finishing second to other sprinters at the Italian finish lines. This is an original small (4"x6") watercolor and ink painting that is available through my artist website at www.greigleach.com. 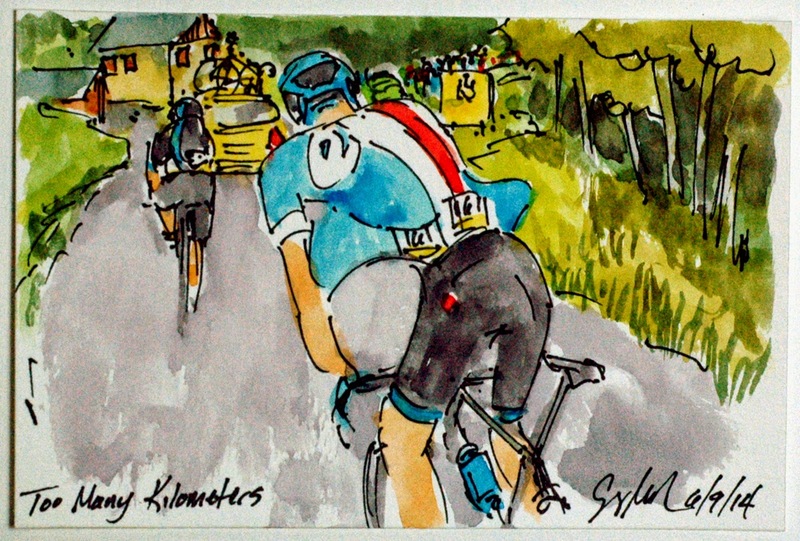 To buy on this particular painting, just follow the direct link at the end of the post to get this piece of art from the 66th installment of the Criterium du Dauphine. The "Tete de la Course" or the head of the race, in this case a three man break away comprised of Natnael Berhane (Europcar), Blel Kadri (AG2R) and Cesare Benedetti (Netapp-Endura). The three got away from the very first kilometer of the stage. One of the hold overs from the days before race radios and GPS transponders, is the time keepers with the chalkboard. The guys in the bright yellow of the LCL race sponsors go between each group on the road and the peloton informing them of the time gaps between each group of cyclist on the road. This is an original small (4"x6") watercolor and ink painting that was created using Yarka St. Petersburg watercolors and Steve Quiller brushes from the North American company, Jack Richeson and Company, www.richesonart.com. In addition, this painting is available through my artist website at www.greigleach.com. 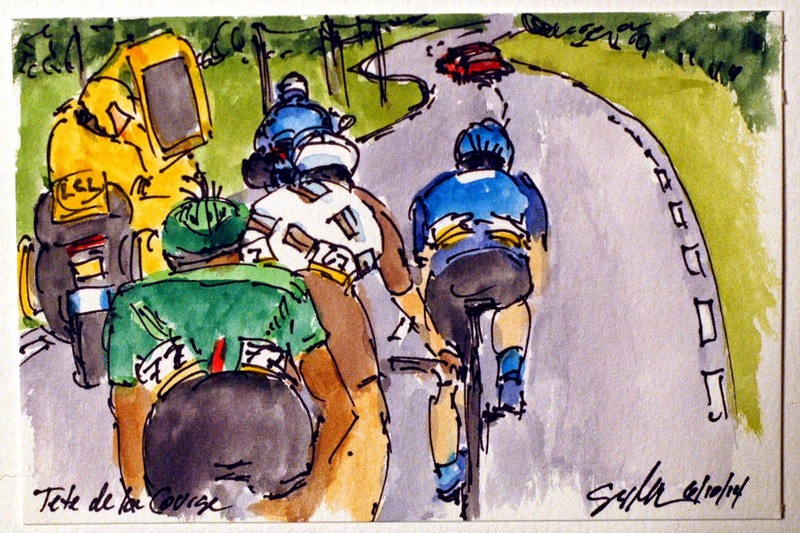 Just follow the direct link at the end of this post for your chance to buy this piece of art from the 66th Criterium du Dauphine. Chris Froome (Team Sky) proved today that he came to race. After taking the opening Individual Time Trial Froome added to his lead and stage win tally on the top of Col du Beal. The only rider who could hold the Sky rider's wheel was Alberto Contador (Tinkoff Saxo), but Contador didn't have enough to get around the Malliot Jeune. So it was that Contador took his second second place in a row to Froome's second first place in a row. Naturally that is how the two stand on the General Classification, with Jurgen Van Den Broeck (Lotto Belisol), Wilco Kelderman (Belking Pro Cycling) and Andrew Talansky (Garmin Sharp) rounding out the top five. This is an original small (4"x6")watercolor and ink painting that could be yours through my artist website at www.greigleach.com. 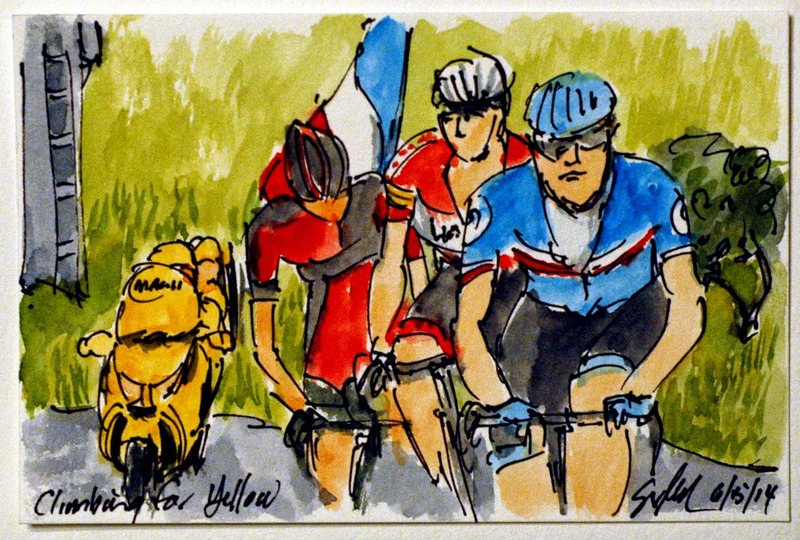 To buy this particular painting just follow the direct link at the end of this post to get your piece of the 66th Criterium du Dauphine. Good luck, but don't delay. As if to prove what I was saying in the previous post, Andrew Talansky (Garmin Sharp) wasn't able to answer the speed of the climbers attacks, but just kept climbing. He eventually road across the gap bringing Vincenzo Nibali (Astana) up to Chris Froome (Team Sky), Jurgen Van Den Broeck (Lotto-Belisol), Alberto Contador (Tinkoff Saxo) and Wilco Kelderman (Belkin Pro Cycling). Once he got to the leading group, he realized he had enough to put in an attack, so he caught then and then went on up the road. He was caught, but he went again. But with his new Yellow Jersey on the line, Froome wasn't willing to let him go. This is an original small (4"x6") watercolor and ink painting that is available through my artist website at www.greigleach.com. 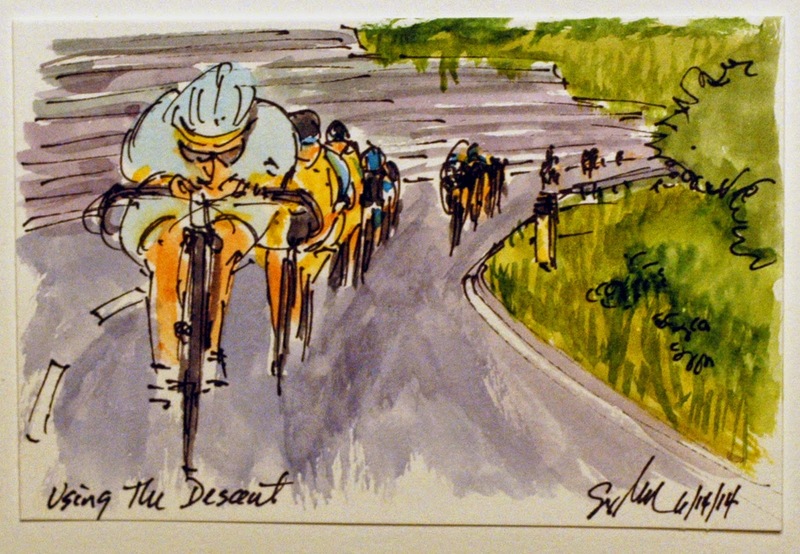 Just follow the direct link at the end of this post to buy this piece of original art of the 66th Criterium du Dauphine. Once Geraint Thomas (Team Sky) swung off the front, it was up to his team leader, Chris Froome (Team Sky) to do what he could to win the stage and hold the Maillot Jeune. Alberto Contador (Tinkoff Saxo) was ready for the attack he knew was coming from the African born Brit. The first attack, easily covered by the Spaniard, proved to put Vincenzo Nibali (Astana) into difficulty. 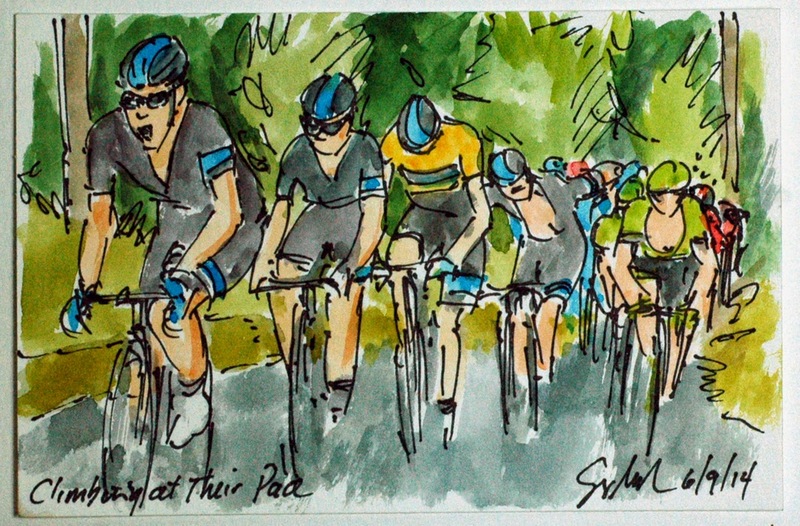 The rest of the peloton did not fare much better against the aggressiveness the purer climbers. However, those that just kept pushing were able to catch the wheel of the wearers of the Yellow and Green jerseys. This is an original small (4"x6") watercolor and ink postcard that could be yours by visiting my artist website, www.greigleach.com. 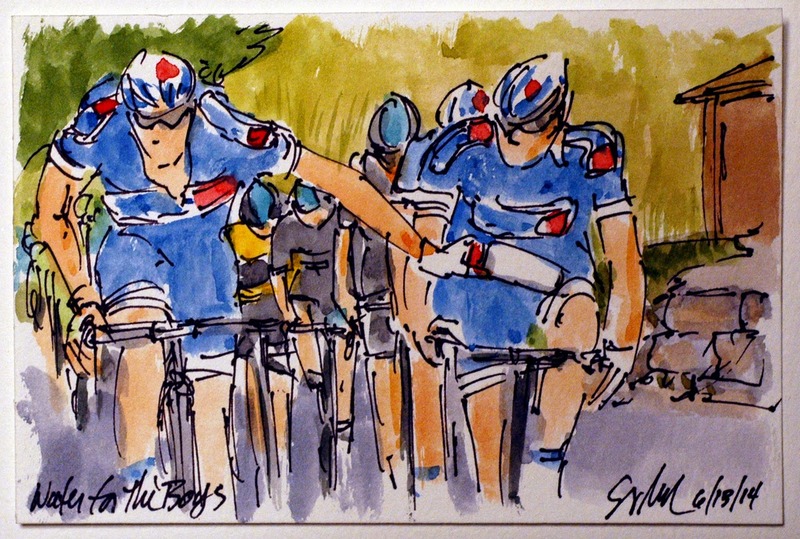 To purchase this particular painting of Stage 2 just follow the direct link at the end of this post. Good luck and don't delay. While he is not the only one in the race, Ryder Hesjedal (Garmin Sharp) has just finished the Giro d'Italia and found that the kilometers he already has in his legs added to the final climb of today's stage were just a little bit too much. 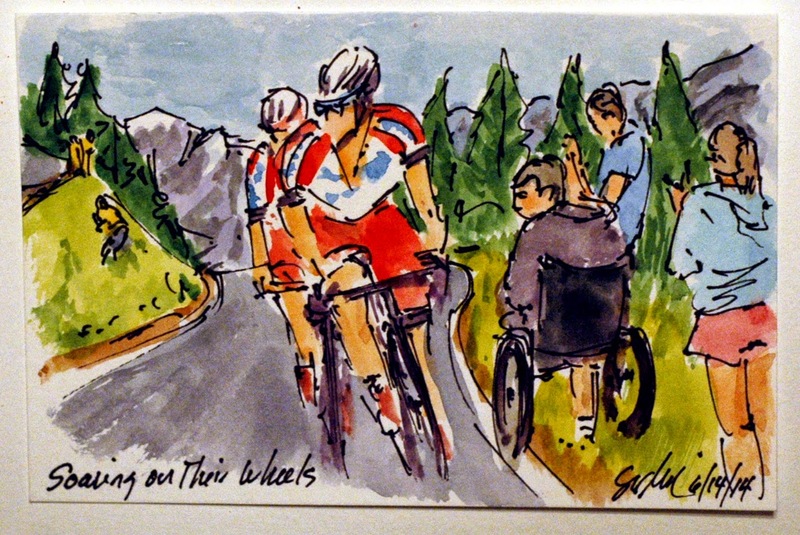 At his point he can still see the peloton up the road, but try has he might, he just can't get back on their wheels. His only comfort was that those who had been riding tempo for their leaders were sliding back faster than he was. 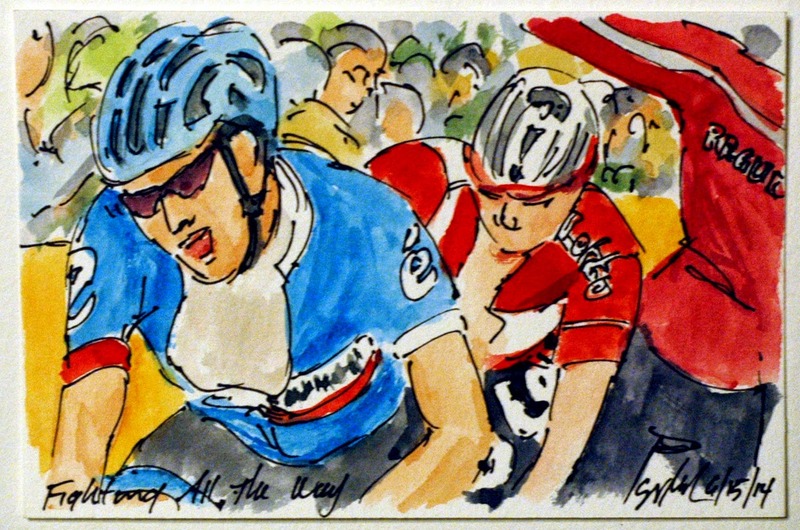 This is an original small watercolor and ink painting that is available through my artist website at www.greigleach.com To purchase this painting from the 66th Criterium du Dauphine just follow the direct link at the end of this post. Good luck but don't delay, you wouldn't want to miss your chance. Team Sky has learned that the way to get and hold the Malliot Jaune, is to hit the climbs and set a hard, fast tempo. A pace fast enough to prevent attacks and hard enough to shed the pretenders. The team has spent a lot of time training with power meters developing the ability to ride the rest of the peloton off of their wheels. Chris Froome (Team Sky) is using his teammates one after the other to reduce his competition, unfortunately, the team put their own, Richie Porte into trouble along with most of the domestiques of their competitors. 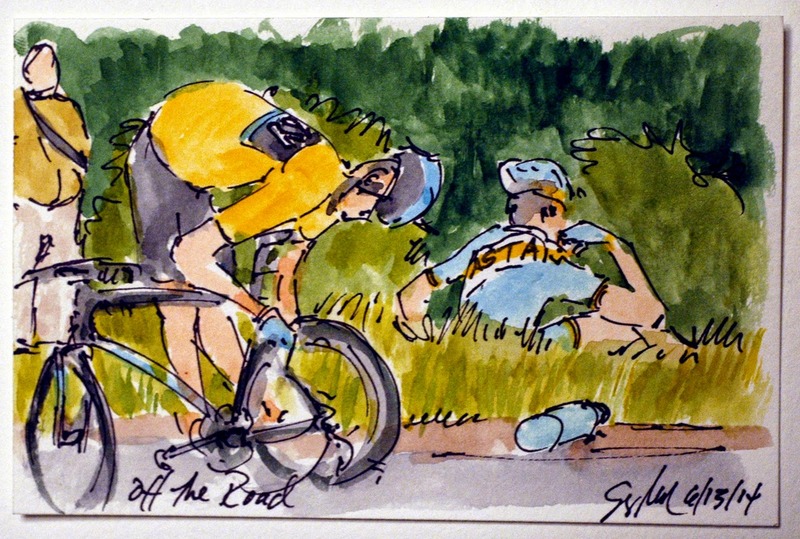 It was Geraint Thomas (Team Sky) would led most of the way up the Col du Beal, until he swung off and Froome attacked. This is an original small watercolor and ink painting, 4"x6", that is available through my artist website at www.greigleach.com. 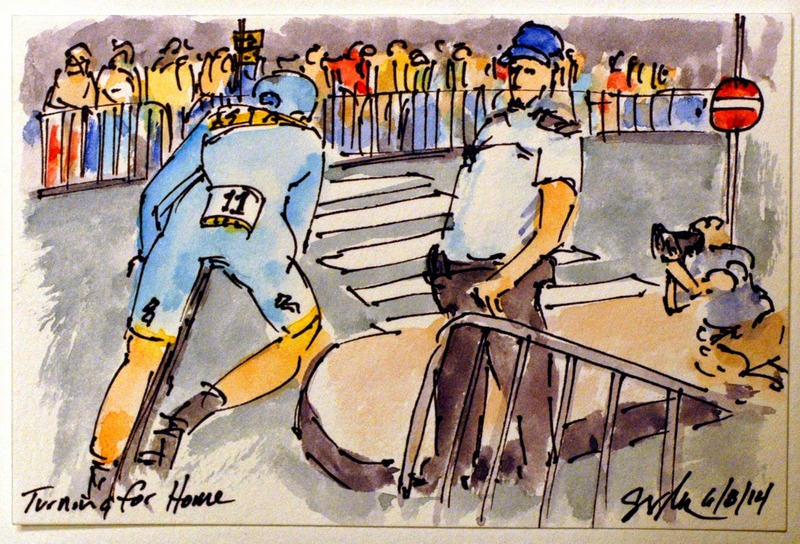 To buy this particular painting of the 66th Criterium du Dauphine just follow the direct link at the end of this post. Rein Taarame (Cofidis) had the dubious distinction of being the first to leave some skin on the roads of France. After his fortunately minor crash, he needed an adjustment to his bike, shortly after this he ended up changing bikes, unfortunately, the crash happen just as the peloton ramp up the speed before hitting the final ascent of the day. 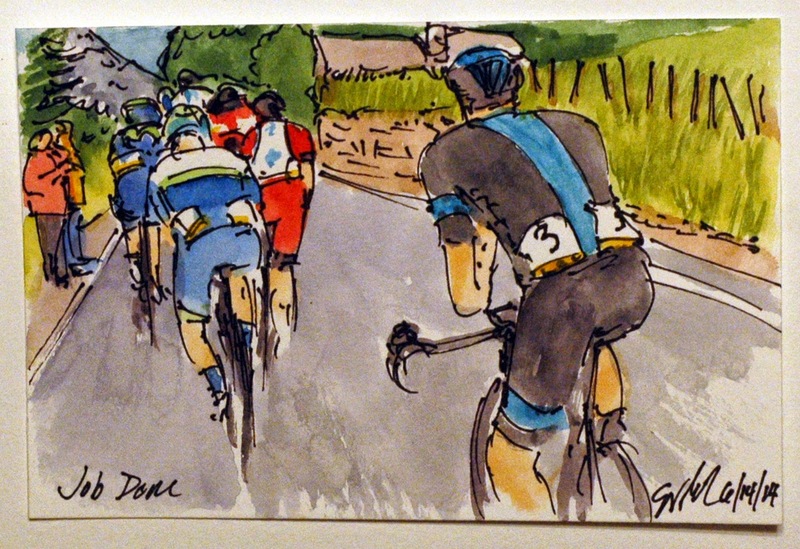 With the contenders' teams trying to position their leaders for the assault on Col du Beal, Taarame was facing a hard chase back, a chase that would burn some of the energy he would need for the climb. Taarame is wearing the colors of Estonia National Road Champion rather than the bright red kit of Cofidis. This is an original small watercolor and ink painting that is available through my artist website at www.greigleach.com. To buy this particular painting just follow the direct link at the end of this post. The painting is only $50 USD and I do ship internationally. 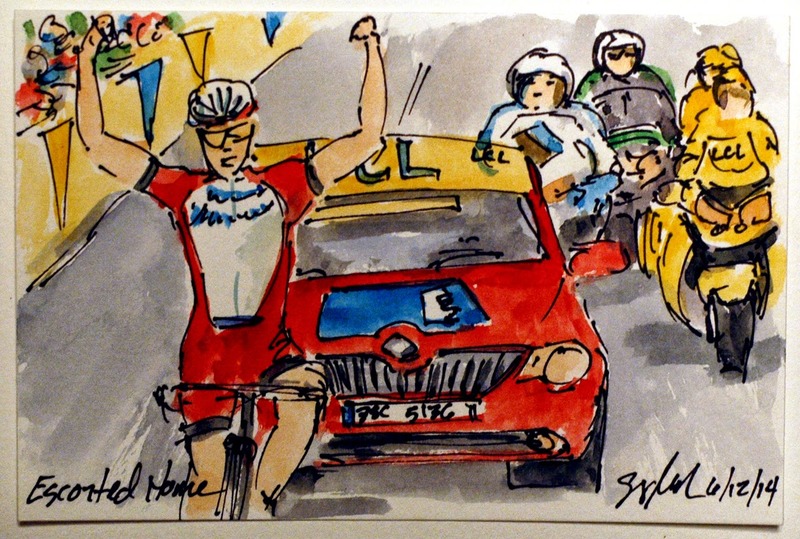 To clarify this title, the leader of the King of the Mountains competition in the Dauphine wears a red jersey with white polka dots (the reverse of the Tour de France). So the five man break knows that one of their group will win the right to wear the jersey at the end of the stage. Today, it was Kevin Reza (Europcar) had the legs to summit the first five climbs of the day first. 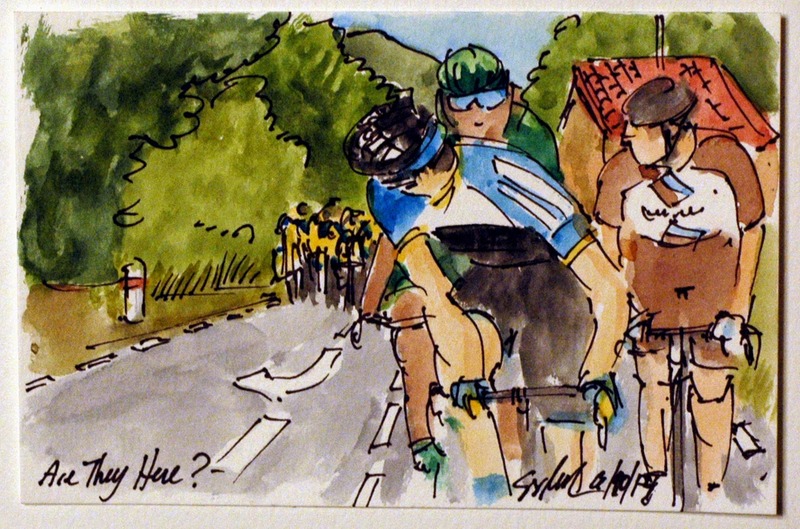 Each time he was followed over the top by Thomas Damuseau (Giant Shimano). Damuseau did have an advantage of knowing these roads, the peloton road past his house at 37 kilometers into the stage. This is an original small watercolor and ink painting that measures 4 inches by 6 inches and is available at my artist website, www.greigleach.com To purchase this particular painting follow the direct link at the end of this post. 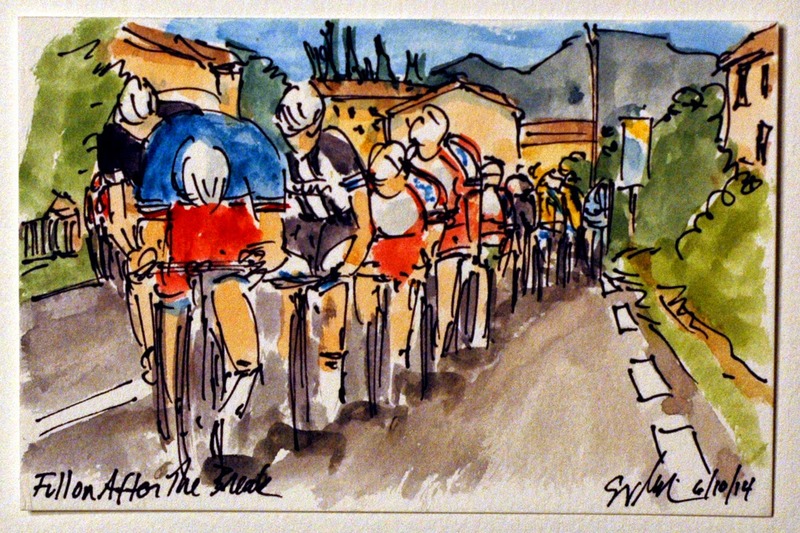 Do hurry though, you wouldn't want to miss out on this piece of art of the 66th Criterium du Dauphine. The first open road stage of the Criterium du Dauphine feature six categorized climbs, a rude awakening to the legs to be sure. With a lot to ride for, these five attacked on the first climb of the day with a Polka Dot Jersey and maybe more at the end of the stage, Thomas Damuseau (Giant Shimano), Alexis Gougeard (AG2R), Kevin Reza (Europcar), Matthias Brandle (IAM Cycling) and Alessandro De Marchi (Cannondale), were all opening for a great result at the end of the day. This is an original 4"x6" ink and watercolor painting that was created using Yarka St. Petersburg watercolors and Steve Quiller brushes from www.richesonart.com. Also this painting is available for purchase through my artist website at www.greigleach.com. To buy this particular painting just follow the direct link at the end of this post. 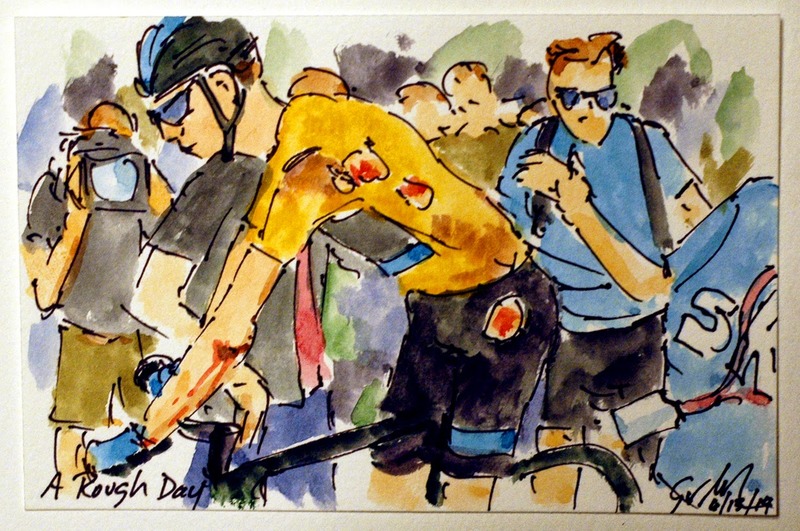 But do hurry you wouldn't want to miss your chance to have a piece of the 66th Criterium du Dauphine. Chris Froome (Team Sky) by virtue of winning the Dauphine last year, was the last cyclist to roll down the start ramp to speed through the streets and tunnel of Lyon in search of a Yellow Jersey, the Malliot Jaune of race leader. Through the course, he appeared to be staying even with Alberto Contrador (Tinkoff Saxo) who has the current race lead and riding just ahead of Vincenzo Nibali (Astana), but it is the time at the finishing line that matters. Froome's time was three seconds better than Contrador giving him the first leader's jersey of the 66th Criterium du Dauphine. This is an original small 4"x6" watercolor and ink painting that is available through my artist website at www.greigleach.com. To purchase this particular painting just follow the direct link at the end of this post. This original art is only $50 USD and I do ship internationally. Under the watchful eyes of the Gendarme and the thousands of cycling fans along the streets of Lyon, Vincenzo Nibali (Astana) makes a sharp right turn after crossing the river and heads into the final kilometer of this race of truth. Nibali has faced some harsh criticism, most notably from his Director Sportif, Alexander Vinokurov (the retired racer that Astana was original built around) for failing to deliver the results his salary merits. Nibali is the winner of the 2013 Giro d'Italia, but hasn't had a single race or stage victory so far in 2014. Today didn't change the stage win stats, but he did put himself in the top ten going into a mountain top finishing stage 2. This is an original watercolor and ink postcard measuring 4"x6" that is available at my artist website, www.greigleach.com. 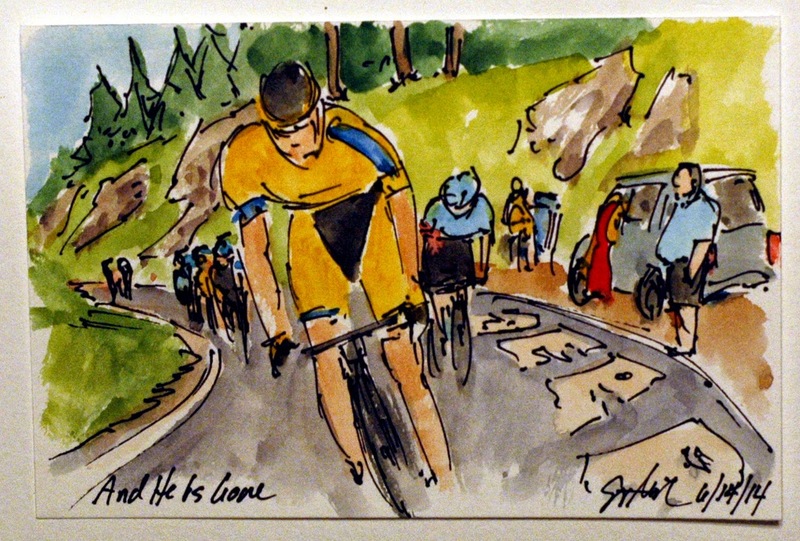 To buy this piece of art from the 66th Criterium du Dauphine just follow the direct link at the end of this post. And I do ship internationally, cheaply. 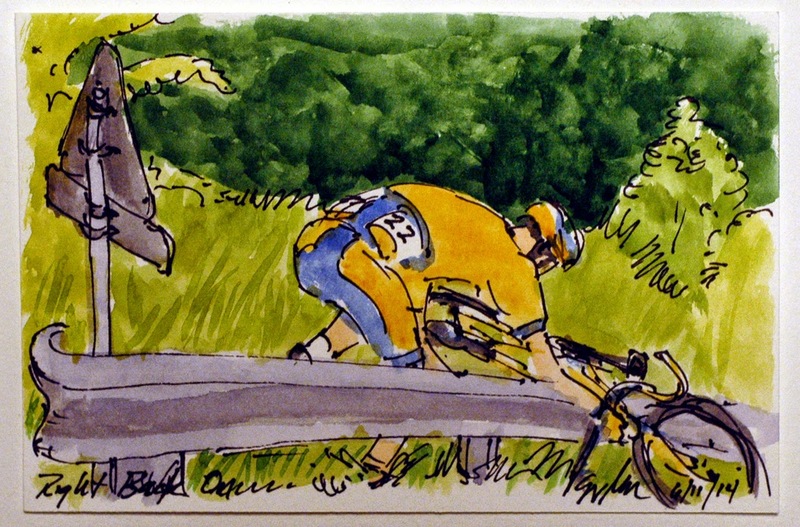 Alberto Contrador (Tinkoff Saxo) came to the Dauphine with a purpose. He is riding to test his form for the coming Tour de France, seeing how he will measure up against the 2013 winner of both the Tour and the Dauphine, along with the winner of the 2013 Giro d'Italia. He was the first of the three big name contenders to cross the line in the opening salvo in Lyon, and he laid down the new best time for the 10 kilometer course. 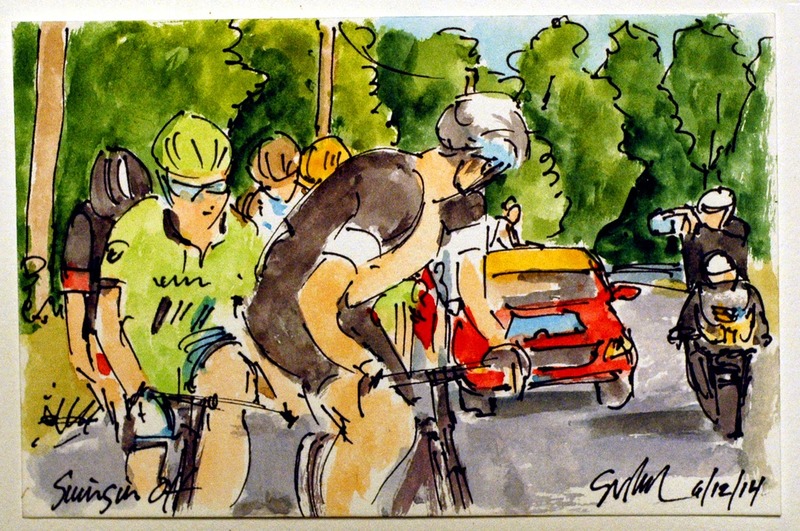 This is an original 4"x6" watercolor and ink postcard that is available for purchase at my artist website, www.greigleach.com For this original work of cycling art, just follow the direct link at the end of this post to get your piece of the 66th Criterium du Dauphine. Today's Time Trial through the heart of Lyon included a multi use tunnel under a hill side in the center of town. The tunnel includes bike lanes (trust the Europeans to include this in their design) and to keep the cyclists visually entertained, the walls are used as video projection surfaces with a wide variety of light shows, video animation and changing colored lighting to amuse even the slowest moving cyclist. David Miller (Garmin Sharp) had a different sort of tunnel vision has he focused on the task of hand, getting around the 10 kilometer course in as short of a time as humanly possible. I doubt he even registered the visual entertainment as he speed through the tunnel at 40 kph. This is an original watercolor and ink postcard that is available in a quick 3 day auction on ebay. 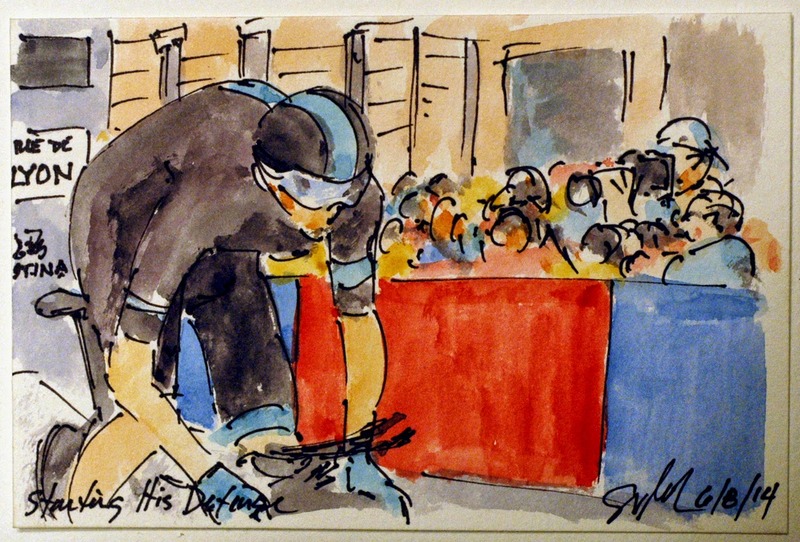 Just follow the direct link at the end of this post to bid on your piece of the 66th Criterium du Dauphine. Do hurry, it is a very quick auction.